I’m sure as kids we all had that secret desire to own a power accessory – be it the magic wand or the power ring. The thought of controlling the world around us with a flick of a wand or button was no doubt overwhelming. But what just had been a fantasy back then could end up becoming reality considering the news about Apple’s patent for a wearable smart ring device. Sharing almost similar traits as the tech giant’s first ever wearable, the Apple Watch, this proposed feature-packed “mini- computer-wrapped around your finger” is supposed to include a touch screen, haptic feedback and voice control. The haptic actuators will notify the ring wearer of incoming messages or other alerts. 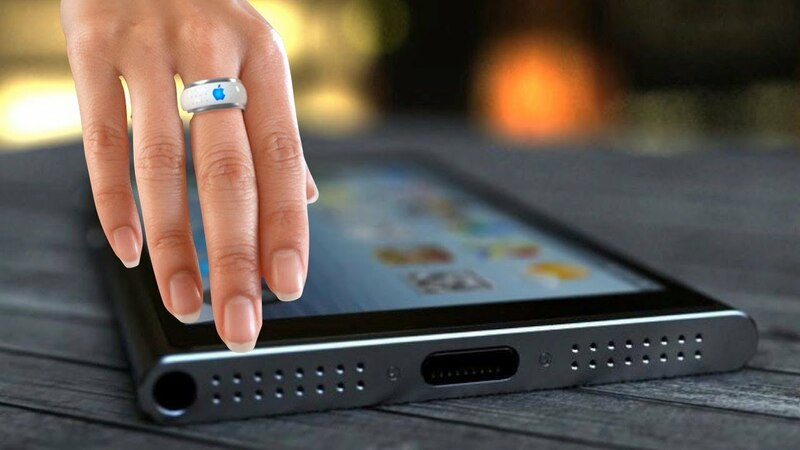 But unlike most smart rings already available commercially from MOTA, the NFC Ring, Ringly, Nod Gesture Ring and, Ring Zero, whose functions are limited to push notifications or NFC-based gesture commands, Apple plans to gear up its ring towards controlling other devices instead of being a mere passive extension of them. Powered with a combination of a voice command function, motion sensors, and the use of near-field communication (NFC) technology, the ring can effectively communicate with other devices, including smart TVs, smartphones, smartwatches, laptops, tablets, car audio or phone systems, and game consoles. And that’s how your childhood dream would come to life — just wave your hand, and your wish is the ring’s command. This wearable device, which is already setting the tech community abuzz, is expected to become an efficient and ergonomic human-machine interface that will intelligently interface with, and control multiple external electronic devices, allowing users to multi-task like never before. Potentially, you could dictate a message to your ring, and send it on your phone or tablet via text, email, or a notes app. The ring could also vibrate for notifications and other alerts. If you are bored of sitting in from of your computer screen just so that you can control it with a mouse, you can use the ring as your personal wearable mouse. What more, you can even expect the ring to control smart home gadgets like lights, garage doors, blinds, in-car entertainment systems, etc. Other features to look out for include GPS location data acquisition (you might not even lose your favourite piece of smart jewelry! ), phone call support and more. As shown in the patent drawings, the ring can be worn on your index finger, and you could use your thumb to navigate on the flat surface of the ring’s side or face. The ring however may or may not have a touch screen. To make things easier the patent also describes built-in accelerometer and gyroscope modules provisioned to accept gesture input with enough precision to facilitate handwriting capture. A user might even wear two rings to control multiple aspects of a host UI. The Patent Application details a ring featuring a finger-mounted touch-screen, multiple processors, memory, built-in GPS microphone, cellular, Bluetooth and Wi-Fi network devices for talking to paired devices and biometric sensors, all of which hold extensive capabilities. What makes the wearable even more interesting is its wireless charging functionality. From precious metals like gold or platinum to stretchable material like silicone, Apple mentions number of different materials that can be used to construct a suitable chassis for its proposed piece of smart jewelry. There is no doubt that wearable technology is on the rise. But the question which still tickles the minds of tech experts, is – Will this technology incorporation into a piece of jewelry, be really accepted by the masses? Google Glass which, for instance, also seemed to be an amazing technology manifestation, hasn’t possibly been adopted widely in its current form. According to experts, in the future we might see a lot more technology integrated into what we wear and even into us, as humans. But it all boils down to social acceptance. Though the Apple Watch has always been a hit, but Apple obviously has a plethora of amazing patented ideas in the labs all the time. Whether this enticing idea of Apple’s smartring would eventually make it to market, is still to be seen. But one thing is for sure – Smart Jewelry is destined to play a major role in the evolution of the wearable tech industry, and if anyone can pull off an idea so alluring, it’s Apple!